I am a strong believer that every culture and country possesses some unique remedies and rituals that preserve health and enhance beauty of their users, making the whole world look up to those men and women and go extra mile to find out what makes them vital and look exceptionally good. Firmly sticking to my theory and keeping it a secret from my husband (who thinks that I go a little bit over the top in my attempt to beat natural processes of aging), on our trip to Morocco earlier this year, I was determined to unveil as many traditional health and beauty secrets of this exotic country as I possibly could. Learning what makes its residents so “well preserved” even in not that mild conditions of the great Sahara desert became my ultimate goal. From what I have learned, I have to agree that the amount of natural remedies and rituals is probably bigger than the country itself. The secrets of the Moroccan men’s vitality, youthful skin and flawless appearance go all the way back to ancient times when only pure oils and other natural ingredients were applied to the body while simultaneously using natural essential oils and fragrances to calm the body and mind. It was believed that as people relaxed, they were able put themselves in the best position to reap all great benefits of any health and beauty treatments or procedures. But the old traditions did not die with time. 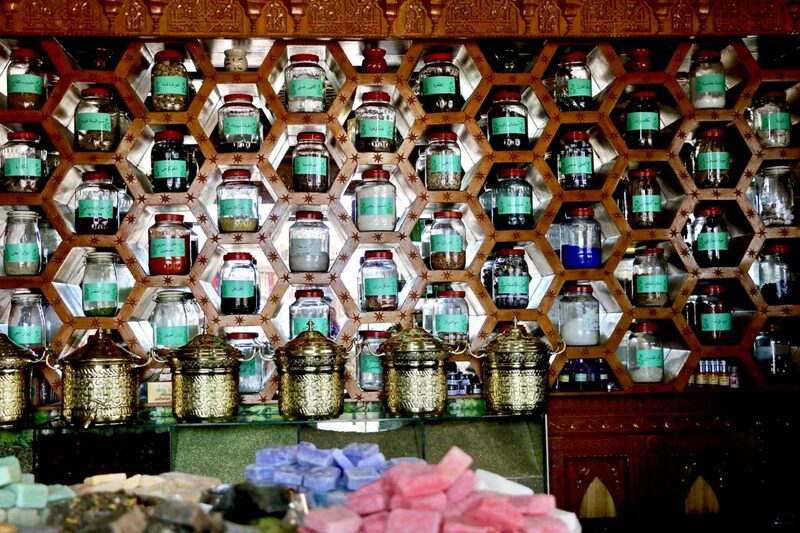 To this day, the Moroccans treat their bodies and souls with respect and tend to prefer the natural remedies to imported medications, commercial creams, lotions and potions. So let us find out what they are. The single most popular beauty secret of all times is argan oil. The Moroccans use this incredibly powerful oil for face, hair and body. High in vitamins A and E, fatty acids such as Omega 3 and Omega 6 and packed with antioxidants, pure argan oil helps keep wrinkles away, makes hair grow healthy, long and thick, hydrates and softens the skin and serves as an ideal natural moisturizer. Sometimes organ oil is mixed with rosehip oil to enhance their work and simultaneously reap the benefits of both of these beauty miracles. However, blending two different oils together is not a very common practice. Staying true to their centuries-long beauty traditions, the Moroccans prefer to keep the oils separately and use them individually for a greater effect. Although argan oil is at the center of the beauty world of Morocco, the country highly favors another natural super oil, prickly pear seed oil or barbary fig seed oil, which is believed to be even more powerful in fighting the dreadful aging marks and wrinkles than the king of all kings, argan oil itself. 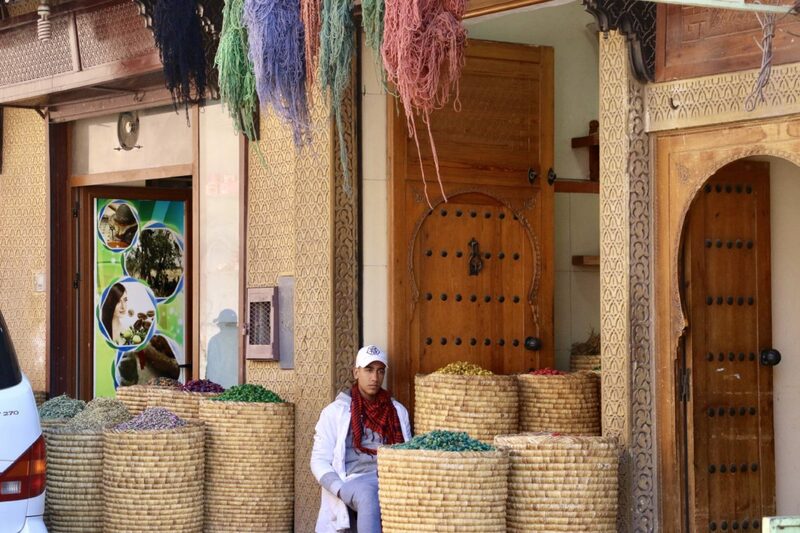 One of Marrakesh’s prominent natural oils experts and merchants who we had a privilege to meet assured us that no other oils can stand comparison with prickly pear oil. As the name suggests, the oil is extracted from the prickly pear or better known the Barbary fig or cactus. Indigenous to Mexico, over time the plant was introduced in North Africa. Excruciating heat, dry weather, and lack of water did not scare the prickly pear. On the contrary, the unique representative of the vegetation world found the difficult environmental conditions highly favorable and expanded all over the region, making Morocco its primary place of residency. And the Moroccans did not mind it at all. Even today they consider this extremely high in Omega 6 and Omega 9, antioxidants, vitamin E and vitamin K oil one of the best natural remedies to shy away fine wrinkles, increase elasticity of the skin and brighten under-eye dark circles. No other facial creams are needed. Apply a few drops of prickly pear oil on your face and hair daily, and the results will not make you wait long. The Moroccan men and women do not limit themselves to only the use of the oils for supporting and improving their, without it, youthful look and luxurious manes. For ages the citizens of Morocco have been generously treated their bodies with massages, body scrubs and wraps and daily or, in most cases, weekly hammam. What is hammam, anyway? Known by a few different names such as Turkish bath or Roman bath, Moroccan hammam is a bathhouse with multiple dry and steamed rooms. Giving a huge importance of water and cleanliness that are seen as sacred in Islam, the Moroccans regard their hammams as special places where the body and soul get clean according to the ancient rituals performed by skillful staff or friends. The hammam journey begins in a dry hot room where you get accustomed to the heat and prepare yourself and your body for a hot steamy room, which is considered one of the most important since the heat makes you sweat a lot and thus purifies your body. Once finished with these two stages of the hammam visit, you slowly relocate to a bathing room where the traditional hammam treatment is gently used on your skin and body. The beauty ritual starts with applying a thin layer of black soap all over your body. Made from olive oil, black or else called Beldi soap penetrates into the deeper layers of your skin and cleanses it from the dirt and dead skin making it look beautiful and radiant. 5 – 10 minutes later, followed by a thorough rinse with a lot of water, your body gets scraped with a kessa glove that, thanks to its granulated tissue, activates blood circulation and sheds off the dead skin. The next step is purifying rhassoul mask that both absorbs the excess dirt and oil and revitalizes and nourishes the skin. In the most luxurious hammams, the traditional treatment is crowned with rehydrating the body with pure argan oil. Today more and more hotels and luxurious riads offer their guests modern spas with professional therapists performing different kind of the massages, facials of their choice and need, hair treatment and combing. However, despite of way too obvious influences from the western world, the Moroccan spas stay true to their roots and include traditional hammams to the wide array of their services. 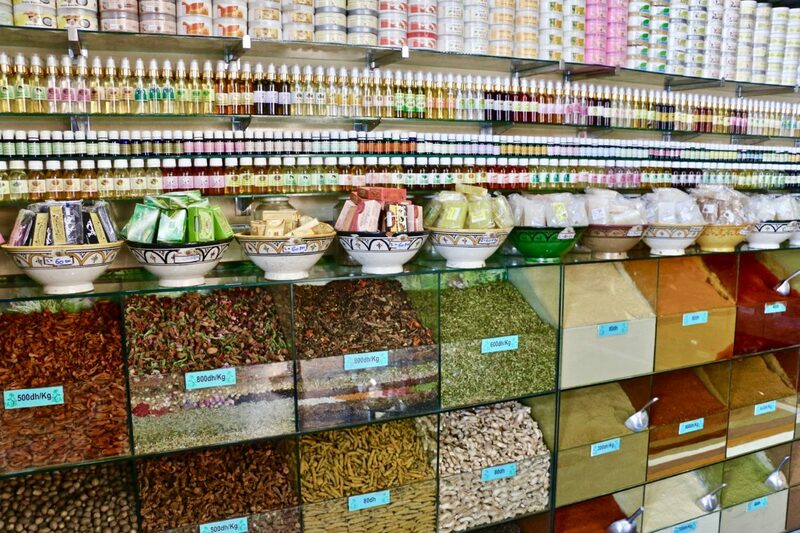 Spices and herbs are another category on our list of things that make the Moroccans healthy and beautiful. Widely used in cooking to enhance the flavor of the food, these humble representatives of a vast family of plants fulfill many other important functions such as treating diseases and illnesses, neutralizing unpleasant body odors, decorating and giving distinguishing aroma to their houses and even keeping away those striving to get inside insects. This might be new to you but not to the Moroccans who take special pride in their spices and use them in many different ways. 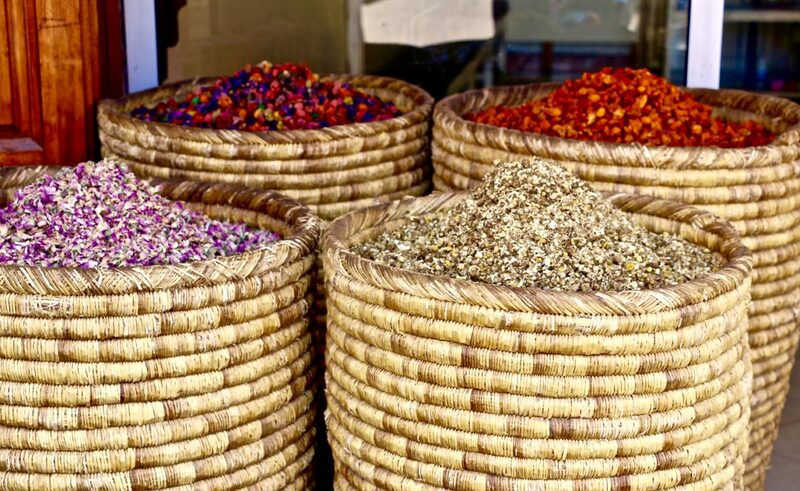 Visiting Morocco, more than likely, you will be exposed to such spices as saffron, cumin, cinnamon, ginger, thyme and many more. Wonder why? 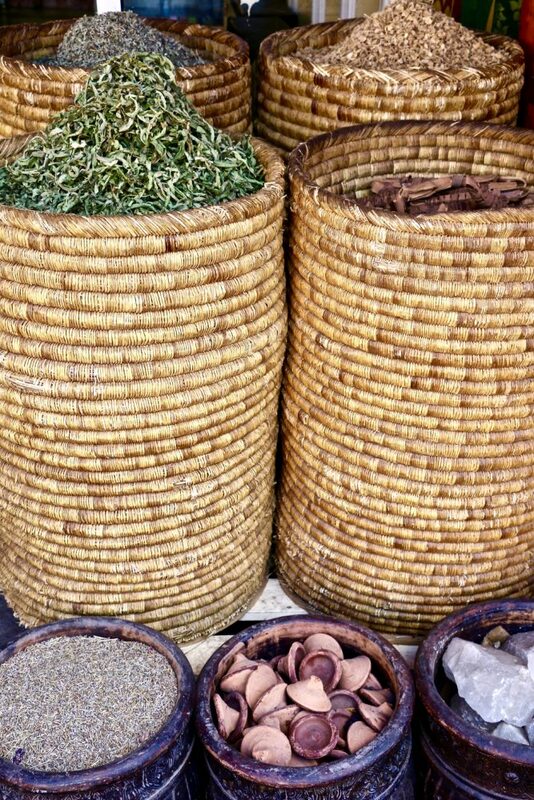 Long ago the Moroccans learned how beneficial each of these spices are for the overall health and wellbeing. For instant, originated in South Asia, cinnamon is responsible for providing the body with antioxidants that protect against viruses and prevent the diseases. The Moroccan women find additional reason to incorporate this sweet and savory spice in their diet. From the early age they rely on cinnamon to keep their skin looking young and fresh. Known for its ability to increase the collagen levels, cinnamon improves the overall look of the skin by increasing its elasticity and preventing the signs of aging. Equally popular cumin helps prevent digestive issues such as bloating, stomach pain and vomiting. On top of that, it can be used to assist with the detoxification processes in the body to cleanse the blood from the toxins, boost the energy, clear the skin and slow down the visible signs of aging. 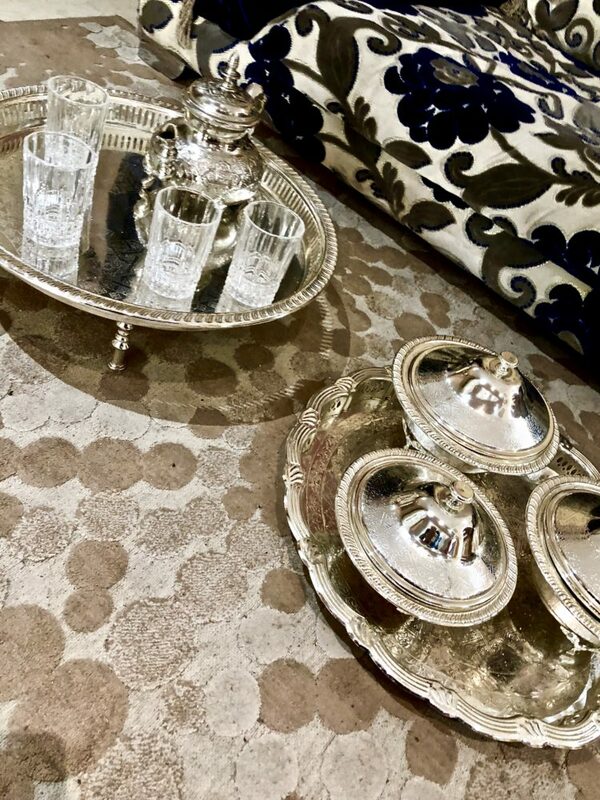 Although the main ingredient of the traditional Moroccan drink, sweet mint tea, is nothing else but an herb, it deserves special attention and a separate space in our discussion. Packed with many health and beauty enhancing benefits, mint tea has been a signature drink of Morocco for as long as the history knows. Indulging in the tea from morning until evening, the Moroccans appreciate not only its sweet taste and pleasant aroma but also the ability to diminish stress and anxiety, soothe headaches, reduce bloating and gas, ease nausea and improve the digestive system. Thanks to the high level of antioxidants, the tea is also used to reduce redness, irritations and burns. Moreover, drinking the tea throughout the day can add to faster fat metabolism aka slender figure. Yes, Ramadan! The ancient tradition observed by the Muslims worldwide, Ramadan is a month-long holiday, a period of fasting and prayer. Used as an act of worship, a chance to get closer to God and become more compassionate towards others and especially those who are in need, during this holy month the Moroccans abstain from eating, drinking, smoking, ill tempers and gossip from sunrise to sunset. “What does it have to do with health and wellbeing?” Surprisingly, a lot. For ages, people used fasting to treat different kind of the diseases and illnesses, to improve health and prolong life. Skeptical of the ancient way of self-healing, numerous studies have been conducted by professional doctors and scientists to analyze how fasting effects the mind and body. Strengthening the importance of Ramadan with its emphases on restraining from all food and water throughout the day, the International Congress on “Health and Ramadan” that took place in Casablanca in 1994 analyzed as mere as 50 studies from all over the world and noted some important health benefits. Besides purifying the body and mind, the main goals of Ramadan, fasting during the holy month assists with substantial weight loss, lowers bad cholesterol levels while increasing good cholesterol and thus decreases the risk of cardiovascular diseases, improves the absorption of nutrients, helps overcome addictions such as smoking, indulging in sweet and fatty food and even gossiping and lying. However, as always there are some restrictions and people with diabetes and severe diseases are advised to restrain from fasting even during Ramadan. Nevertheless, these exceptions do not diminish the health and beauty benefits of one of the oldest Moroccan traditions. On the contrary, it only reminds us that the wise Moroccans uncovered some of the best wellness practices ages ago and follow them vigorously to this day. Majestic Pure Moroccan Argan Oil for Hair, Face, Nails, Beard & Cuticles – for Men and Women – 100% Natural & Organic, 4 fl. oz.